1. The current Ebola virus disease outbreak was declared a ‘Public Health Emergency of International Concern’ by WHO on 8 August 2014. On 8 September, the UN Secretary-General activated the UN system-wide crisis framework and subsequently announced the establishment of the ‘United Nations Mission on Ebola Emergency Response’ – UNMEER. UNMEER is described as a ‘unified mission’, different from a ‘regular’ or ‘integrated’ mission, with HQ UNMEER in Accra, Ghana, and offices in each of Liberia, Sierra Leone and Guinea. 3. While this is not a ‘humanitarian operation’, the present guidance is primarily intended to guide aid workers of international and non-governmental health and humanitarian organizations supporting the Ebola crisis response effort, and their implementing and operational partners, interacting with foreign military commanders and staff and/or civil defence and civil protection units deployed to support the affected state(s). It may also help guide health and humanitarian workers in their interaction with national military or civil defence units. Decision-makers in Member States and Regional Organizations may also find it useful when considering the use of military and civil defence assets (MCDA) to support the crisis response. 4. The guidance is intended as generic reference that can be adapted to the specific situations and needs in the three main Ebola-affected countries – Liberia, Guinea and Sierra Leone – and as relevant and necessary in other countries within the region. 5. Under international human rights law, health is recognized as a fundamental right of the individual that must be protected in all circumstances. In addition, health is addressed in international humanitarian law provisions related to the protection of health facilities and personnel (during conflict). 6. 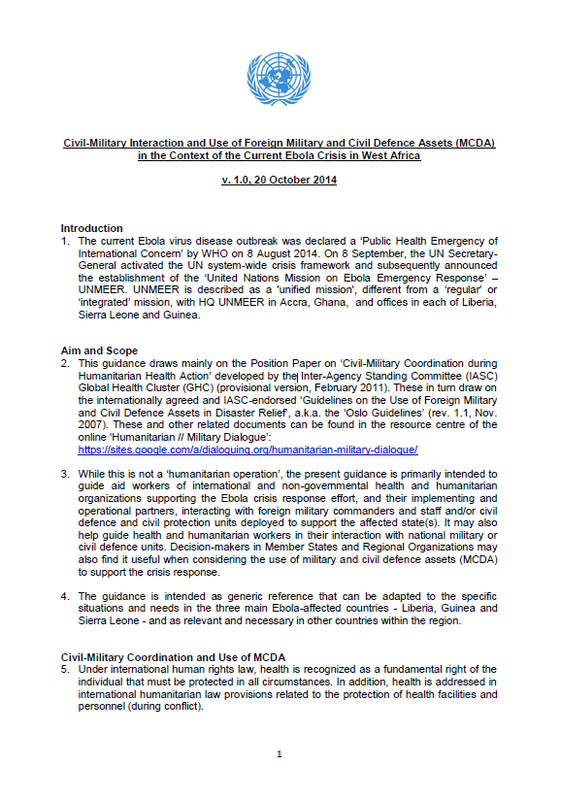 In view of the uniqueness and magnitude of the current Ebola public health crisis and the overall international support and commitments to address the situation with all means possible, including Member States’ military and civil defence assets, it is understood that civil-military interaction is overall based on a cooperative relationship. 7. Dialogue and information sharing between military and health and humanitarian personnel is essential. It creates a common situational awareness to guide planning and decision-making, including on the use of available foreign military assets. Coordination should take place with all foreign military actors through relief activities and information shared through established coordination mechanisms, to avoid duplication. 8. Task division between military and health and humanitarian personnel is also an important factor. This includes identifying potential or actual capacity gaps and the critical window of delivery of goods and services. 9. Joint planning and task management, to the extent possible, will ensure maximum efficiency and avoid overlaps and gaps. Co-location in the established mechanisms, such as national Ebola Operation Centres, would optimise the use of assets. Any parallel mechanisms or structures should be avoided as far as possible. 10. In some specific settings as described in para 13 below, in order to preserve respect for humanitarian principles, these activities may be limited or non-applicable, unless they are immediately life-saving and/or directly related to a context of protection of civilians. MCDA should meet the specific needs and requirements presented to Member States. MCDA should complement overstretched civilian capabilities. MCDA should provide unique advantages in terms of capability and timeliness. MCDA should be used for a limited duration. MCDA contributions should be at no cost to the affected State(s). 12. Any consideration of use or deployment of MCDA and related consultations should be channelled through either the affected state(s) or UNMEER. 13. Due to the insecure operational environment in some countries in the region, the respective military forces present and involved in any Ebola response or preparedness activity could be a potential party to a conflict. In accordance with the ‘Guidelines on the Use of Military and Civil Defence Assets to Support United Nations Humanitarian Activities in Complex Emergencies’, a.k.a. the MCDA Guidelines (Rev. I Jan. 2006), should these or other foreign military resources be considered or deployed in active security-related functions or operations, the civil-military relationship has to be managed carefully and on a case by case basis to avoid association and maintain a clear distinction between military and health and humanitarian aid workers. The perception by local actors and populations of foreign military and peacekeeping troops is also a factor to be taken into account. 14. As a general rule, interaction with the military and the pursuing of common goals must not compromise the actual or perceived neutrality, impartiality and operational independence of health and humanitarian aid workers. Establish and sustain collective dialogue, communication and interaction with foreign military forces deployed to support the Mission. Establish a mechanism for information exchange and interaction between health and humanitarian aid workers and military forces and other armed actors, appropriate to the operational context. Support the development and dissemination of context-specific guidelines on civil-military relations and the appropriate use of foreign MCDA, as relevant and required. Ensure appropriate use of foreign MCDA to support the Mission and its health and humanitarian components. Ensure coherence of relief efforts to avoid duplication of military and health and humanitarian activities. Monitor activities by foreign military forces and ensure they have no negative impact on affected people or the health and humanitarian community. Assist in negotiating issues in critical areas of civil-military coordination. Maintain a clear distinction of the identities, functions and roles of health and humanitarian and military personnel, particularly in situations described in para 17 above. 16. Much of the support provided by foreign and UN military forces will be logistic in nature and WFP may also provide capability to ensure best use of military assets. Health and humanitarian actions should not be used to advance security and/or political agendas. Health services provided by military actors must be in line with the assessed needs of the affected population. All actors – civilian and military – involved in the provision of health services should follow the national government’s health priorities and plans. Health and humanitarian aid workers must constantly review the evolution of the crisis and, when necessary, adapt civil-military coordination modalities to possible emerging conflict dynamics and new roles played by the military. Maintaining humanitarian identity is paramount. Health and humanitarian aid workers should be aware of the perceptions of stakeholders and how different degrees of civil-military coordination may change local perceptions of their impartiality. 18. Military and civil defence / protection support could include both ‘indirect’ and ‘direct’ health assistance. Assisting in preparedness/contingency planning for humanitarian health response. Assisting in joint health assessments and information sharing with health authorities and assisting actors. Rehabilitation/construction of public health facilities. Coordination with civilian health authorities (national and/or international) to avoid duplication of initiatives and different health care standards. Provision of equipment to health facilities/institutions, consistent with national health guidelines. Provision of water and sanitation systems, in compliance with the minimum humanitarian standards. Construction of camps/provision of shelters, in compliance with the minimum humanitarian standards. Transport of medical and other relief items. In certain situations only the military possesses the appropriate means of transport (e.g. helicopters) to reach isolated populations. Triage; first aid; medical evacuations, regardless of nationalities or affiliation. Direct patient care (including trauma and non-trauma care). Assisting in health care life-saving activities, in coordination with civilian health authorities (national and/or international). Vaccinations and other public health interventions. Distribution of medical supplies and relief goods where no other viable civilian option is available. Properly coordinated health monitoring and surveillance. Training of civilian and military health personnel. 20. Several cases have been reported of attacks against teams collecting bodies believed to be infected with Ebola or conducting community based information campaigns. While the overall operational environment is considered non-conflictual, national and/or foreign military or civil defence units may be called on to protect the civilian population and health facilities and prevent looting thereof, as well as create an environment where health and humanitarian personnel can deliver health and humanitarian assistance. 21. In exceptional cases as described in para 13 above, military escorts may be requested in high risk areas to facilitate access to affected areas and people and ensure security for health and humanitarian personnel and facilities. The updated IASC-endorsed Guidelines on the Use of Armed Escorts for Humanitarian Convoys (February 2013) refer in these extreme cases.